There are all sorts of opportunities for volunteering with the Trust. From one-off or occasional book packing sessions to helping in the office, warehouse or at events. We are blessed to have a number of loyal volunteers who help us across a range of activities. 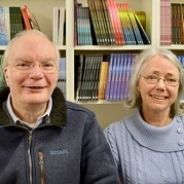 Rob and Marion Marshall have been providing invaluable support with our pre-loved book collection. Thanks to the generosity of so many of our local supporters, we now have some 2,500 second-hand Christian books, many nearly new. These are in good condition and cover a range subjects from theology through to biographies and autobiographies. Whilst many are sent to the nations, some are perhaps more relevant for a UK readership, so we have been holding a number of book sales, the funds of which cover the costs of mailing titles to our recipients across the world. Although we are thrilled with our burgeoning collection of pre-loved books, their cataloguing and storage has given us some extra challenges. Collating information following our book sales has also proved time consuming. To our delight we have now secured the volunteering services of Rob and Marion Marshall. Marion has been cataloguing and categorising our second-hand book collection, whilst Rob has been packing the books safely away in numbered boxes within our warehouse. Rob has also been looking at improved ways of keeping our pre-loved book records, making it easier to search for and access the books. This has been a huge undertaking and we are incredibly grateful for their ongoing support. Volunteering offers a chance to make new friends, increase confidence, learn new skills and even to add to your cv. Our volunteers tell us they get a "real buzz' out of making a difference and we are so grateful for their support. If you feel you would like to lend a hand on an occasional or regular basis please do get in touch to find out more.